If both sets of data are continuous plot a line graph. You can think of continuous data as being measured from a scale. If one set of data are discrete plot a bar graph. Discrete data may be colours, blood groups, shapes; variables that are not measured using a scale. Keep equal intervals within a scale on the axes. Join the points with a ruler Do not extend the line to zero. 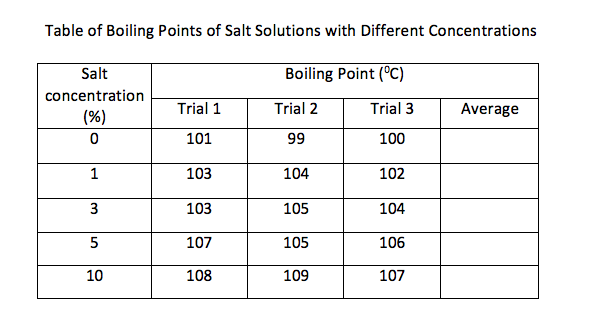 Task 2 Plot a graph of the class data for boiling points of solutions of different salt concentrations. In your white laboratory books complete the requirements for writing your investigation on boiling points of salt solutions. Task 4 Introduction to the concept of "Matter"
We cannot see the individual particles which make up water. 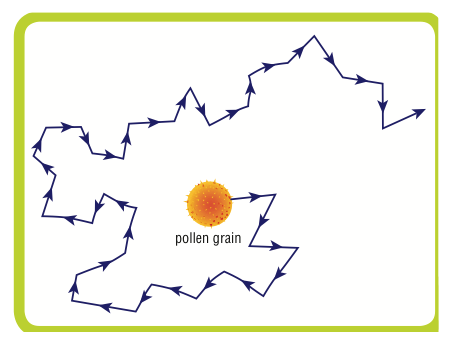 We can see the effect of these particles on the pollen grain which shows a series of random movements due to being hit by the water particles. Spend 5 minutes at each Station..
Make an inference about the nature of the materials involved.